After last week's spotlight on the Durham Bulls, I realized that I haven't featured nearly enough Carolina League teams so I decided to ramp up a little series on some classic hats from that league starting next week. For this week however, I have to shift the focus onto a more pressing matter: my birthday which is tomorrow, January 26. 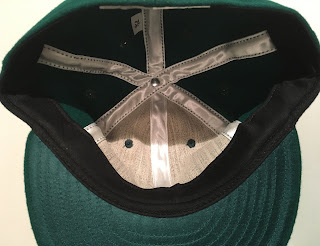 That date happens to be Australia Day so this week's Fresh Fitted Friday selection is a reproduction of the cap worn by the Australian national baseball team for an exhibition game against the US team on December 1, 1956 as part of the 1956 Summer Olympics. Wait. December? Don't forget when it's winter here, it's summer over there, mates! Behold the Green and Gold! I like the gold felt "A" here against the dark green crown and bill but I really hope people don't mistake me for an Oakland Athletics fan. The great thing about Ebbets Field Flannels is their caps are always top-notch so there's no need to go into any sort of detail about that. Quality-made in the U.S.A. every time. In 1956 Baseball was the "foreign" demonstration sport at the Melbourne Summer Games. The U.S. team, consisting of players from the Far East Command, played Australia in a 6-inning game at Melbourne Cricket Ground. The Americans won 11-5. As much as I love vintage hats, finding ones like this Australia hat is nearly impossible so I'm thankful Ebbets produced it. One thing I wish they would do more is crowdsource ideas for future hats from their loyal customers (such as myself) because the caps on my Wishlist would be stellar additions to their list of offerings! This cap isn't one that I'll be wearing on the regular but nevertheless, it's got a special place in my heart because of my affinity for Australia so it's not going on the Trading Block but please don't hesitate to reach out if you want any other cap from that list and you are willing to part with any of the hats on my Wish List.